Our mMission: Scopevisio increases the profitability of its customers! 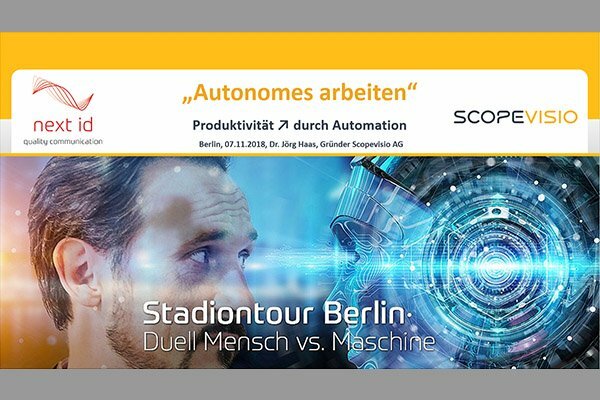 Ein Vortrag von Dr. Jörg Haas, Gründer Scopevisio AG vom 07.11.2018 in Berlin. Digitalisation does not mean anything else but a fundemental adaption of startegy, structure, culture and almost all processes within an organisation. 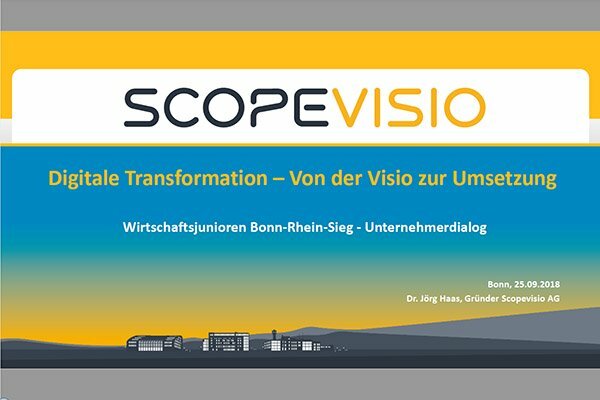 A presentation from Dr. Jörg Haas, founder of Scopevisio AG at “Wirtschaftsjunioren Bonn-Rhein-Sieg – Unternehmerdialog” dated 25.09.2018. The Filosof Software GmbH is software partner of the hotel and restaurant industry since more than 25 years. For the participation of that industry in digital transformation processes a technological change is neccessary, that could not have been managed by Filosof itself under the current circumstances. In the Bonn based Scopevisio AG Filosof has found the ideal partner. A result of that merger will be „Filosof 4.0“, a saas based software solution. In this interview Dr. Jörg Haas talks about the reasons for the acquisition. Filosof – im April 2018 Scopevisio has acquired Filosof Software GmbH, a leading manufacturer of software for the hotel and restaurant industry. A result of that merger will be „Filosof 4.0“, a saas based software solution. Cloud Computing and Artificial Intelligence are more and more given in the health care industry! Digital transformation means bringing in question your own right to exist and accordingly to question the entire medical treatment within the german health care system. If IT companies group under the name of Web Solution Community, the Best-of-Breed approach is not allowed to be discussed without a deep platform integration. Everybody who wants to present himselves as modern or pioneering has to have the right answers to the questions related to digital transformation in the health care system. Dr. Jörg Haas writes the most urgent questions in the diary of the United Web Solution Community: 1) One marketing cooperation is not enough; 2) A deep integration platform as PaaS incl. REST, Webservice, OAuth and HL7 V3 RIM format is mandatory; 3) Nothing will work anymore without Artificial Intelligence; 4) The man-machine interaction needs to be created in a modern way; 5) A business model as IT provider with SaaS fees, MMR and “pay what you get” is recommended. What impact will artificial intelligence have on finance software applications and auditing? The digital transformation in companies has the same impact on the work of the accountans. Accountants have to be asked how the intend to react on the rapid digitalisation of their clients. Whether Data Mining, Process Mining, Artificial Intelligence, Expert Systems, BOT Automation, Deep Learning and Co., digitalisation has an impact on audits. A presentation from Dr. Jörg Haas, founder of Scopevisio AG at the Cloud-Unternehmertag 2017 in Bonn. 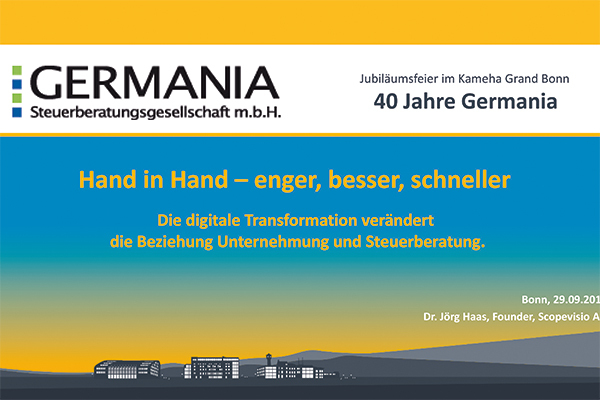 A presentation of Dr. Jörg Haas, founder of Scopevisio AG at the 40-years anniversary event of the Germania Steuerberatungsgesellschaft mbH. The IT magazine „Computerwoche“ has released a presse article dated Juli 2017 about the HW PARTNERS strategy. Under the headline “With HW PARTNERS AG an investment company located in Bonn is on its way to provide cloud solutions to the german small and medium sized businesses. As the founders are stating Scopevisio and Centerdevice are just the beginning.” we learn a lot of things about the long term strategical focus of the company. Press release of the dated 06.07.2017: Scopevisio extends partnership with Microsoft expert agindo. As a High-Tech-Holding company the HW PARTNERS AG, located in Bonn has aquired shares in Microsoft integration partner agindo and has insofar secured additional Microsoft expertise. The aim is to extend and strengthen the Microsoft integration in the cloud based business software Scopevisio. June 2017: Dr. Jörg Haas is an passionate entrepreneur, visionary for digital transformation and expert for artificial intelligence. He ist founder and board member of the HW PARTNERS AG, the BonnVisio Group and the Invite Group, all located and based in Bonn. We have provided his detailled CV for download in pdf format. 08.06.2017: ERP-Interview with Scopevisio: digital assistants and artificial intelligence (AI). The ERP-News-editorial team under the leadership of Matthias Weber has made an interview with Dr. Jörg Haas (Scopevisio AG) about digital assistants and artificial intelligence (AI). The ERP-Interview provides interesting views into the vision of prospective software generations. Scopevisio founder Dr. Jörg Haas is presenting the digital voice assistant „Scoper“ at the CeBIT in march 2017. Via Scoper voice-activated commands like “what was our turnover last month?” can be adressed to the business software Scopevisio. Scopevisio processes that command and emits the result as a voice message via Scoper. 2017: Prof. Dr. Alexander Pohl, partner of HW PARTNERS AG has released his new book “Innovation und Marketing”. The book is the result of many years of scientific and practical experience in the area of ​​innovation management. It is based on the perception that innovation and marketing must be inextricably linked. The book provides cutting-edge insight in both scientific and practical matters. It starts with a description of current technological trends and evolutions. The focus is on key technologies that are crucial for the digitization of companies, such as cloud computing, the Internet of Things, Semantic Web and Big Data. The authors believe that textbooks on innovation management and innovation marketing should also take these development trends into account. Particular emphasis is laid on the systematic distinction between product and service innovations. The usage innovations introduced here relate to services in which companies generate revenues from the application of innovation on the customer side. Corresponding lease and pay-per-use pricing models are becoming more and more important with regard to digital products. These pricing models are also used by the affiliate companies of HW Partners.